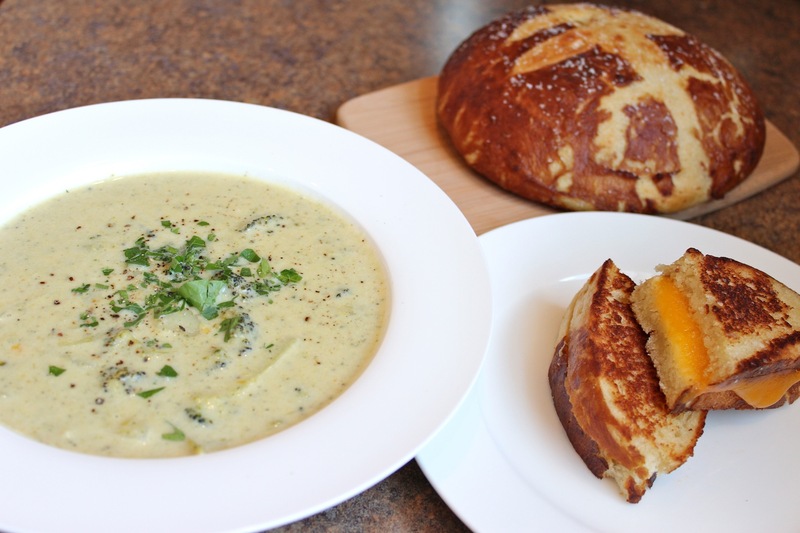 A little while ago I had mentioned that I made some Broccoli Cheddar Soup and some Pretzel Bread, and wanted to share with you since they turned out so yummy. The Pretzel Bread was found when I was perusing around this cute blog that I recently stumbled upon, The Apron Archives (isn’t that the cutest name?). I made sure to pin it so I wouldn’t forget about it. Turns out I couldn’t stop thinking about it and needed to try making some soon. So I made it to go with a Broccoli Cheddar Soup the other weekend, and the two made for many heart-warming meals. 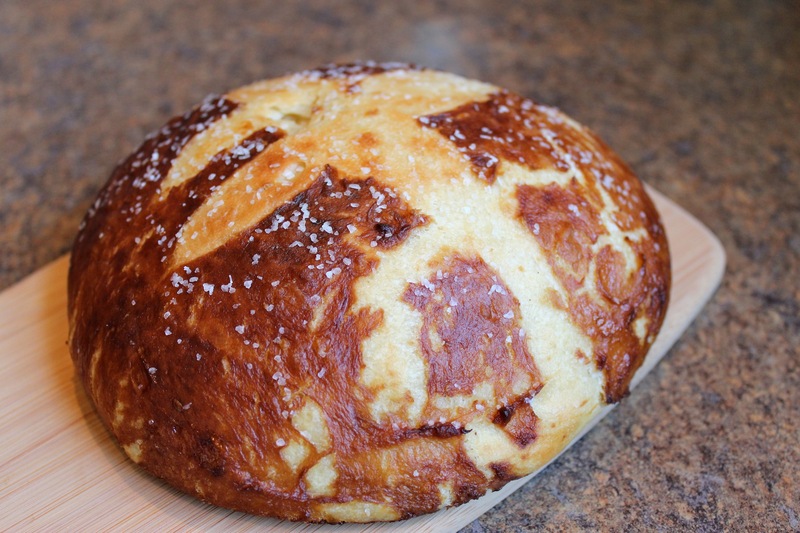 I won’t write out the Pretzel Bread recipe, as you can find it over here and here. I highly recommend it, especially if you like making bread but don’t like spending a lot of time on it. In a hot pot over med-high heat, sauté onions until translucent, about 4-5 min. Add in leeks and garlic and saute another 4-5 min. Add in the potatoes and broccoli, a pinch of s+p, and let cook and steam until they’re a little tender, about 7 min., stirring frequently. Sprinkle in the flour, stir and cook for a few minutes to cook out the raw flour flavor. Pour in chicken stock and let cook until hot, then stir in whole milk. Let simmer until the potatoes and broccoli are tender enough to eat and the soup has thickened a little. Ladle about a third of the soup into a blender and puree. Pour back into pot. If you prefer a completely creamy and smooth soup, use an immersion blender, take the pot off the heat and puree the soup until smooth. (For this soup, my hubby and I prefer the chunks of veggies to bite into, so I puree just some of the soup to make it a little more creamy). Sprinkle in the fresh herbs, season with salt and pepper to taste. To serve, garnish with a big pinch of cheddar cheese and enjoy. I love adding the cheese to the soup as it’s dished up and let it melt in the bowl, as I think the cheese flavor just sort of disappears when added into the big hot soup pot. This is my kind of dinner (and lunch) for all the cold winter days we’re having. Enjoy! 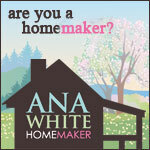 I’ve got into a zone of making a lot of dough, and wanting to keep making more. I’m not talking about the kind of dough that comes in the green paper form, although that’s nice to make too. Talking about the nourishing kind, that’s good for the heart and soul, and makes your house more of a home. I’m working out of one of my top favorite bread baking books, The Bread Bible, by Rose Levy Beranbaum. This is one lovely book for your bread baking and mastering, I highly recommend it if you already make a lot of breads, or want to learn more and get into it. I’ve done pizza dough out of this book, along with some quick breads, the Basic Soft White Sandwich Loaf, Basic Hearth Bread, Brioche, and the Mantovana Olive Oil Bread (a great hearty multi-grain with some whole wheat and olive oil, and a local specialty of Mantua, Italy). When I worked at a local restaurant in Whitefish, I made all the bread for dinner service and did small loaves of Basic Hearth Bread and the Mantovana Olive Oil Bread. Everyone loved it! Who wouldn’t love a little basket with two different kinds of warm homemade bread to fill up on before getting your dinner! 😉 I also made the Brioche loaves there for a while for the Sunday Brunch. I have several pages marked in this book of breads I want to learn more about and have yet to make. I want to read up on, and hone my skills on Sourdough and sourdough starters (which has a whole chapter all to itself), along with the Chocolate Chocolate Chip Bread, English Muffins, Monkey Bread (a cinnamon-y breakfast/dessert kind), Cinnamon Raisin Loaf, Butter Popovers, Beer Bread, Rosemary Focaccia, Ciabatta, and Pugliese. Just to name a few. I’m not going crazy and wanting to do too much, am I?? Today I baked three loaves of the Hearth Bread, I just got all giddy when taking it out and having the house smell of fresh baked bread! I made the dough yesterday and refrigerated the finished dough overnight, and baked the loaves today. It’ll be great to have a couple of these loaves in the freezer. I also have a starter for some Heart of Wheat Bread setting on the counter and fermenting right now. For these kind of Hearth Breads, I usually make my breads in a two day process. Day 1: Make the sponge/starter and let rest at room temperature 1-4 hours, then cover bowl tightly and refrigerate overnight, up to 24 hours. Day 2: Take starter out, complete the dough making process, portion into equal sized loaves, shape, let rise, and bake. OR: Make up to a finished dough, refrigerate overnight, and shape and bake on the third day. Day 1: Do the process all the way to a finished dough, then cover tightly in a large bowl or container, refrigerate overnight. Day 2: Take out of fridge, let rest 1 hour, shape, let rise, bake. Or, you can do it in one day of course, starting in the morning and baking the bread by evening time. I probably just made all that sound overwhelming and like too much work. But really once you get the process down, your active working time is not that much, maybe 1 1/2 hours for the whole process. So, back to these beautiful loaves! Also just did these ‘Heart of Wheat’ loaves, did the whole process for these in one day. Fresh baked bread? Yes, please! Three loaves of Basic Hearth Bread. One loaf for now, two for the freezer! Shaped rounds doing their first rise, then second..
Sprinkle flour mixture on top of starter, then cover to ferment for 1-4 hrs. Spending a day every once in a while baking bread, or even just incorporating the little sections of the process into your day, is so rewarding. If you’re inspired to get making some lovely loaves, check out Rose Levy Beranbaum’s Bread Bible (or any bread/cookbooks you have on hand!). She also has a blog, Real Baking with Rose.